you anything about the jobs themselves. The blu line on the above chart could very well reflect a recovery with a labor force that’s rising faster than the population and with new jobs paying more than lost or existing jobs. That’s certainly not what we have now. What we have now is a US population about 50 million higher than it was in 2008 but a labor force that has stayed about the same. Ergo, the labor force participation rate has plummeted to its lowest since 1978. Also, there are more part time workers vs. full time workers than there were in 2008 and generally the quality of new jobs since 2008 has been lower than that of jobs lost. The largest employer in America right now is Wall-Mart and the second largest is Kelly Services – a temp agency. Other than that this recovery is knocking it out of the park. Drum and his fellow travelers on both the left and right have little interest in teasing out reality. Their job is to create narratives which fit and advance a particular political persuasion. Chiding them for inconsistency is as consequential to them as the proverbial water on a duck's back. The fact is that this was the slowest recovery of any post war recovery and it was associated with less spending increase and less public sector hiring. The other fact is once again the republicans lead us to a cosmic crash and the democratic party dug us out slowly but steadily and with no help from the republicans. 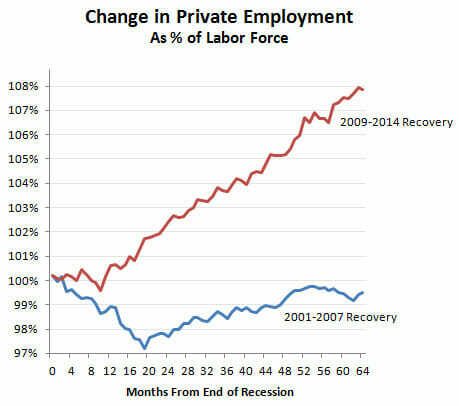 Drum shows that the )1 recovery was HELPED by increased public hiring and the Obama recovery was hurt by the lack of public hiring. Likewise the 82 and 91 recession recoveries with higher rates of spending and public hiring were much quicker than the recent recovery. At best austerity lost 2 out of 3 cases. Add in Europe where you had many more examples with much greater austerity almost all doing far worse and you guys loss and Keynes wins again because Keynes is right. muirgeo seems unaware that in the huge escalation of housing prices, there was a huge escalation in revenue to the state and local governments and they hired people they could not support when tax revenues went down. It was the overspending by governments that forced the release of government employees. The Obama administration tried to get stimulus money to governments to support their payrolls, but that ultimately failed and, in fact, was just a saste of the stimulus money. The democratic party did not dig out. In fact, they prolonged it by saving bankrupt auto companies and banking institutions who are now doing the same things that got them in trouble in 2008. We have never had any austerity since Eisenhower. To argue it has failed is nonsense. When was the last time the actual government spending went down? Again you republicans crash the economy in Great Depressions and Great Recessions and then rather than taking responsibility for the massive failure of your policy and your actions you blame democrats for taking so long to clean up your mess... that's not a way to win over people who are actually paying attention and free-thinking type of individuals. .
You clearly have little understanding of history, business, or finance. It was FDR who first got the government into the housing market. It was Jimmy Carter who first got a hold of the idea of CRA and subprime mortgages. It was Clinton who extended the CRA as part of the Glass-Steagall repeal. It was Raines at Fannie May who was the leader in MBS when the banks who had been forced to write these sub prime mortgages needed a way to get them off their books. Then it was Greenspan (encouraged by Krugman) at the Fed who lowered interest rates to create another bubble. It was Bush who tried to get control of Fannie and Freddie, but was stopped by Chris Dodd and Barney Frank. Anyone who attempts to argue that it is all a problem of Republican policy is neither paying attention nor free thinking. The word you should have been using to describe yourself is "ideologue".
" 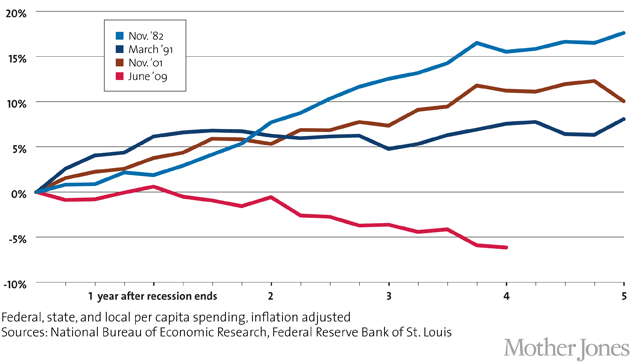 led to a stronger recovery than the spending-fueled 1990 version"
Uh, the comparison is not with the 1990's. It's with the 2000's. The significant expansion of government spending during the Bush administration. Is there too much cognitive dissonance in your brain to read the chart. Dems had BOTH houses of congress in 2007 and 2008 so Bush could not have done anything without support from the democrats. Also, the chart only shows spending and in the other recoveries, a better economy led to better GDP growth and tax revenues, thus the ability to support higher spending. Also, the chart is per capita and includes state and local which significantly muddies the comparison. Muirgeo is leftist filth. He's a doctor...a Marxist doctor that embraces all of the failed policies and murder that his ideology has caused in the last century. He also single-handedly got open comments shut down on Cafe Hayek due to his trolling. He is as obtuse and obstinate as our own Zachariah, Larry G., and a few others. Nothing will be learned or gained from any interaction with this dooshbag. Just noticed that his avatar is the tyrannical FDR...typical of assclown Marxists such as he is. With regard to fiscal policy, the current and projected paths of government expenditures in the advanced economies are quite different than during past recoveries, when policy was decisively expansion-ary, with increases in real primary government expen-ditures. In some advanced economies, especially in the United States, the fiscal stimulus introduced at the outset of the financial crisis was far larger than during earlier recessions. However, the stimulus was unwound early in the ensuing recovery. Specifically, expenditures fell during the first two years of this global recovery and are projected to continue to decline modestly in the coming years (Figure 1.1.2). positions this time around than in the past.